This past weekend Matt and I had a sort of pre-Christmas celebration. We opened the gifts we didn't want to take with us while traveling, had a big leisurely breakfast and a lovely roast for dinner. Matt was in charge of the roast pork tenderloin. He had an idea for it that had been mulling around in his head for awhile. The idea grew from an article he read about someone who was making and selling apple cider syrup. It sounded so good to him that he bought a gallon of cider to try it himself. Making the syrup is pretty easy. Basically, put the cider in a pot, one with a large circumference to spread out the heat is best. Let simmer until it reduces and thickens to your desired consistency. It took almost all day to reduce it to a syrup. It'll look cloudy at some points along the way, but ends up beautifully shiny. Watch it carefully towards the end as it can become apple cider caramel pretty quickly. (Ours is actually slightly thicker than we wanted, but heated pours well). It has a wonderful flavor, sweet with a touch of tart. It'll remind you of a caramel apple. We got a little over 1 cup from just under a gallon of cider. This is actually a steal since it was selling for $30 for 3 oz. The syrup can be used on pancakes or waffles, it would be amazing on vanilla ice cream, but Matt wanted it for a sauce for pork. 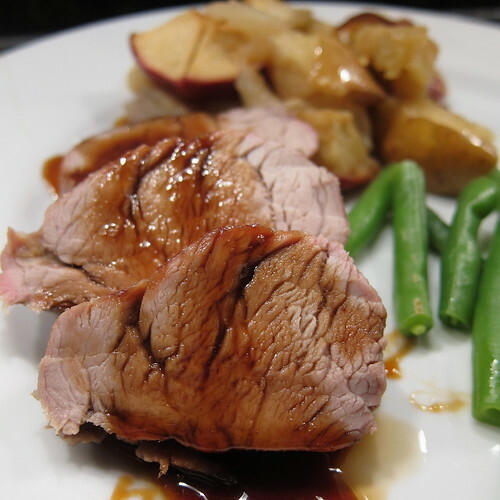 The pork is marinaded in bourbon and then roasted with apples and onions. It is a dish that is full of warm comforting winter flavors. And bonus, the apples and onions roasted with it become an easy side dish. The pork needs to marinade for 4 - 6 hours before roasting, so plan ahead. 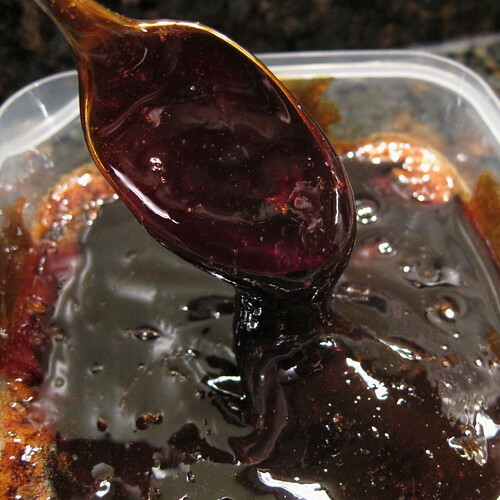 Mix the vinegar and honey together in a microwave safe bowl. Microwave until the honey is softened enough to stir in. Mix in the salt until dissolved. Add the cayenne, olive oil and bourbon. Put in a plastic zipper bag just big enough to hold your tenderloin. Add the pork. Seal the bag removing as much air as possible. Marinade in the refrigerator for 4 - 6 hours. Put the onion and apples on the bottom of a small roasting pan. Remove the pork from the marinade and place on top. Roast for about 30 minutes, until the pork is 165 F in the middle. Let rest a few minutes before carving. Top with heated Apple Cider Syrup. Oh wow! You are right, that syrup is crying out for icecream! But the pork looks so juicy and delicious too. that shot of thickened syrup is glorious! 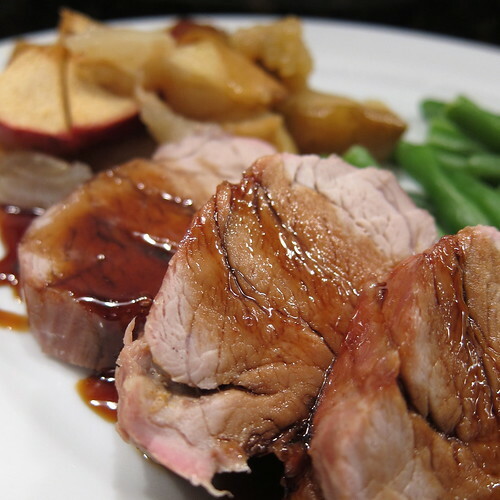 pork and apple will never NOT be terrific together! Oh my drool worthy dishes. Holy cow Batman it looks incredibly delicious. I bet it was totally packed with flavor. This looks delicious! They sell apple cider syrup around here, and I never knew what to do with it - this looks so good! And now I can just make my own!